Catch us if you can: Those looking to dethrone Ballintubber now know their groups in the Mayo GAA Senior Football Championship this year. Photo: Sportsfile. The draws for the Mayo GAA senior, intermediate, junior A and junior B championships took place in MacHale Park on Wednesday evening. The defending senior champions, Ballintubber, were drawn in a tough group with last year's beaten quarter-finalists, Garrymore, Hollymount-Carramore and north Mayo big guns Knockmore - who were the fourth seeded side that most teams were looking to avoid. Beaten finalists last year, Breaffy, have been pitted once again against south Mayo side Davitts in the group stage and Kiltane and the 2017 intermediate champions Bohola Moy Davitts. 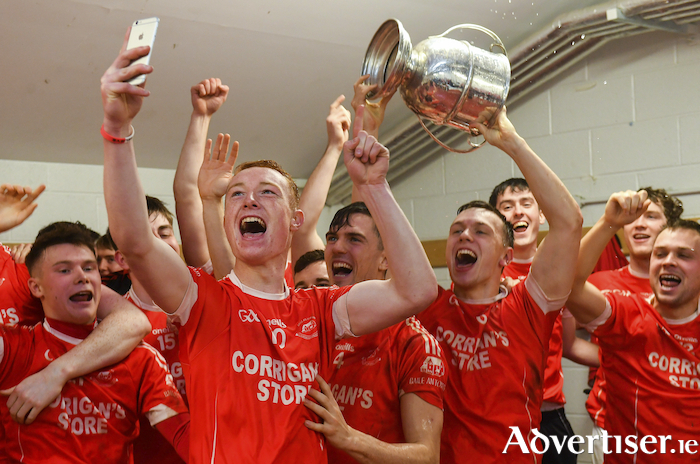 Castlebar Mitchels, who were knocked out at the semi-final stage last year by Ballintubber after an epic encounter that needed a replay and extra time, have neighbours Westport, Aghamore and the most successful side in championship history, Ballina Stephenites, in their group. While the other beaten semi-finalists from last year, Ballaghaderreen, will square off against local rivals, Charlestown and last year's intermediate champions Belmullet and Claremorris, who will be looking to push on from their u21 title success last season. Group D: Ballaghaderreen, Claremorris, Belmullet, Charlestown Sarsfields. In the intermediate championship, Crossmolina Deel Rovers, who were relegated out of the senior championship last year, were the first name drawn out of the hat on Wednesday night and they were placed in a group alongside fellow north Mayo sides, Bonniconlon and Ardnaree, with Swinford the fourth side in the group. The second group is an all west Mayo affair with beaten finalists from last year, Burrishoole, having to tangle with Parke-Keelogues-Crimlin, Islandeady and the 2018 junior champions Balla. There is a very south Mayo feel to Group C, which pitted Ballinrobe, Mayo Gaels and The Neale together along with east Mayo men Ballyhaunis. The final group has two sides who claimed junior honours in recent years, Lahardane and Louisburgh alongside Kitlimagh who have come so close to winning this title over the last few years and south Mayo side Shrule-Glencorrib. The senior and intermediate championships will be played over the following dates: Round One - Weekend of April 13/14, Round Two - Weekend of August 24/25 and Round Three - Weekend of September 8/9. Those who are looking to follow in Balla's footsteps and claim the Mayo junior championship now know the first hurdles they will have to overcome following Wednesday night's draw. Last year's beaten finalists, Achill, have been pitted with last year's Junior B winners Westport B and north Mayo duo Ardagh and Knockmore B. Kilmeena, who were beaten in the semi-finals last year, will square off against Ballina Stephenites B, Ballycroy and Kilmovee, who claimed the Junior B title in 2017. The other beaten semi-finalists from last year, Kilalla, have been pitted with south Mayo side Kilmaine, Tourmakeady and Ballintubber B while Castlebar Mitchels B, who were relegated from intermediate last season, have been placed in a group with Cill Chomain, Ballycastle and Charlestown Sarsfields B. Group D: Killala, Ballintubber B, Tourmakeady, Kilmaine. Group D: Breaffy B, Crossmolina Deel Rovers B, Moy Davitts B, BYE - just three teams in this group. The junior championship will be played over the following dates: Round One - weekend of April 20/21, Round Two over weekend of May 18/19 and Round Three over weekend of June 22/23. Page generated in 0.0812 seconds.